Procured and aged at the highly accoladed and respected Fromagerie L'Amuse in Santpoort-Noord, Holland, just outside of Amsterdam, L’Amuse Brabander Goat Gouda is made from Saanen goats indigenous to the Brabant region. 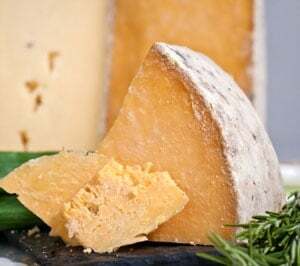 Over the years, owners Betty and Martin Koster have built up the L’Amuse brand to be one of the more respected gouda producers in the country through their affinage, or cheese maturation process. 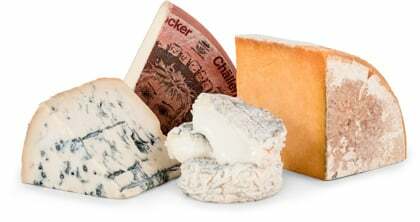 They’re known for aging goudas at higher temperatures, resulting in greater complexity and depth of flavor in their cheeses' flavor profiles. This month’s featured Brabander Goat Gouda is not an extra-aged gouda (some are aged as long as 4 years), spending on average between 6-9 months in L’Amuse’s cheese caves. We work closely with The Essex Street Cheese Company in New York to bring you this amazing cheese. If you like goat cheeses… and you like gouda, this may become your new favorite all-time cheese! No doubt the first thing you'll notice about this cheese is its striking bone-white rind and paste, a hallmark of a goat cheese. The flavor is intense, complex, and super savory: sweet buttery notes, big tanginess, sweet grass and hay earthy notes, and hints of nuts. In short, a huge, sweet, umami bomb. Its mouthfeel is luxurious, silky and creamy. You could say it’s got it all: good looks, a big assertive, outstanding flavor profile, and super creamy texture. It’s so clean and sweet that you may be questioning whether or not it’s really a goat's milk cheese. You’re going to love it. Its sweeter flavor profile will pair well with walnuts, almonds or bread. It would also pair nicely with a bolder, hoppy ale or crisp Sauvignon Blanc.